The Caucasus is the term used to describe the transcontinental region spanning Eastern Europe and Western Asia, straddled by the Black and Caspian seas. 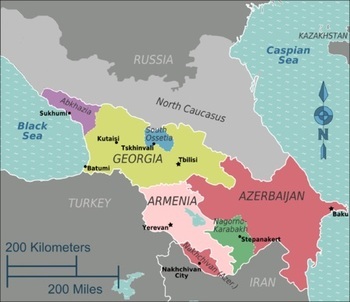 It includes the modern nation-states of Georgia, Azerbaijan, Armenia, and a small part of Russia, as well as the disputed territories of Abkhazia, South Ossetia, and Artsakh. The region takes its name from the Caucasus mountains, which have been characterized as a natural bulwark between Europe and Asia. The Greater Caucasus straddles the border of Russia and Georgia, while the Lesser Caucasus covers Georgia, Armenia, and Azerbaijan. With its rugged snow-packed peaks and deep gorges, the range boasts the highest mountain in Europe, Mount Elbrus. The high mountains and glaciers give way to rolling lowlands, high deserts, alpine meadows, vast steppes, and dense woodlands. Historically, the Caucasus has been a region on the edge of empires. Lying at the crossroads of The Middle East and the Eurasian Steppe, the Caucasus was host to clashes between greater powers. Aided by rugged natural features, its cultures resisted centuries of foreign rule, invasion, and war, be it by Greeks, Arabs, Persians, Turks, and Mongols. All of the countries in this region were also parts of the Soviet Union, with a certain ruler of the USSR originating from Georgia. The Caucasus is noted for its cultural and linguistic diversity. Three major language families — Kartvelian, Northwest Caucasian, and Northeast Caucasian — are endemic to the region. The linguistic landscape also includes Turkic languages such as Azerbaijani, and Indo-European languages such as Ossetian and Armenian. Russian is also commonly used as a lingua franca throughout the region.